NIA CHARLESTOWN NEVIS (February 21, 2018) — Cuban Ambassador to St. Kitts and Nevis His Excellency Abelardo Hernandez Ferrer, paid a courtesy call on Premier of Nevis Hon. Mark Brantley on Tuesday, February 20, 2018, at the Premier’s office at Pinneys Estate. 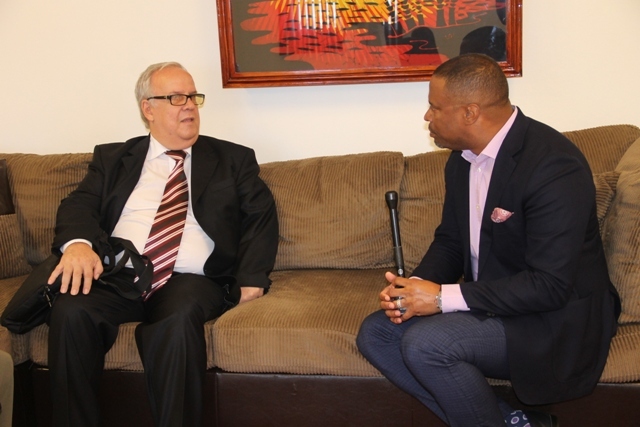 Premier Brantley, who is also the Minister of Foreign Affairs in St. Kitts and Nevis, welcomed Ambassador Ferrer, while reflecting on the diplomatic relations in the past. “Cuba has a long relationship with St. Kitts and Nevis and has provided tremendous assistance to our country, so we’re very happy to have you here to strengthen and deepen our cooperation,” he said. In response, the Cuban Ambassador registered his pleasure to be in the Federation. “I’m delighted by the relations that exist between St. Kitts and Nevis and what has been started by Fidel Castro and I wish that everything will continue in the same vein in the future,” he said. Mr. Ferrer also expressed his desire for continued relations with the Federation. “The relations between St. Kitts and Nevis and Cuba have been going on for more than two decades and I’m hoping that with the new direction in Cuba, with the new presidency that should be coming up shortly, that it will continue to be the same,” he said. Ambassador Ferrer graduated from the University of Havana in 1987, having majored in Russian Language and Literature. He commenced his career as a Russian Translator to Cuban and Cuban embassies. During 2015 to 2017, Ambassador Ferrer served as the Specialist of the Europe Division of the Ministry of Foreign Affairs of the Republic of Cuba. The Ambassador was accompanied to Nevis by Mr. Winston Hanley, Translator at the Embassy of Cuba in St. Kitts and Nevis.